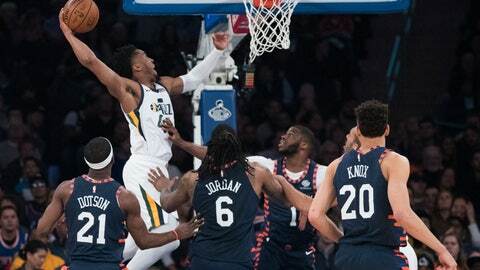 NEW YORK (AP) — Donovan Mitchell and Joe Ingles poured in shots from the outside and Rudy Gobert couldn’t miss from inside. “We’re doing a lot of things great on offense and defense,” Mitchell said. Robinson blocked a shot in his 29th straight game, breaking Patrick Ewing’s Knicks rookie record.